Yes, we haven't sailed off the edge of the world (yet). Actually, we've been sitting in a delightful little basin off the Tradewinds Hotel, about 5 miles from Fiji's capital, Suva. When we last wrote, we were exploring the reef encrusted north coast of Viti Levu. Since then, we've been up to Savusavu on Vanua Levu where most of the cruising families are hanging out for the cyclone season. 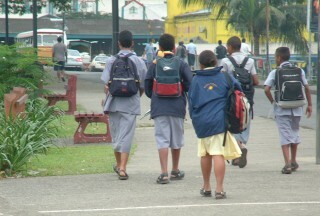 Then we came back to Suva (about 120 miles or 200km) for Chris to take some more of his university entrance exams. He got a 1500 on his SAT-1's (760 verbal, 740 math, all out of 800) which he was very happy with, although he was surprised to get a better verbal score as he's always preferred math. For his SAT-2s he got 770 in Math, 790 in Physics, and 680 in English. Recently, he's been burning up cyber-cafe time, writing college entrance essays and applying to universities: Stanford, MIT, University of California (Berkeley, Santa Cruz, and San Diego), University of Washington, Cal-Tech, and Western Washington. He'll probably follow close to his father's footsteps in some area of Computer Science. Fiji has been fun, but we didn't expect to spend so much time in Suva. We're not really city people, and Suva's the biggest city in the oceanic South Pacific. But it's also the first place we've been for over a year that has both qualified workers and reasonable prices (laborers get US$10/day and a qualified foreman might get $30/day). Since "cruising" is often characterized as "boat maintenance in exotic places" (with limited resources), we've been "cruising" in this vein for a few weeks now . We now have a new leak-proof bimini over the cockpit, re-stitched and repaired dinghy cover and trampolines, a re-sealed front window, and a reinforced trampoline track that was starting to crack from a poorly done earlier repair. We've spent many afternoons swimming at the hotel or playing pool. For a while, there was a big 62' (19m) catamaran from Australia here with a British father and his 2 sons. Amanda (15) and Adam (17) quite hit it off, so we spent a lot of time with them, often playing tennis in the afternoons after school and/or going to a movie in town in the evenings. But they needed to go back to Aus so we sailed (well, motored) around to the west end of Viti Levu with them on their boat. Their 250hp turbo-diesels push them along at 10-15 knots (almost twice as fast as we motor) and their 2 generator-sets easily power their 3 air conditioning systems. Fun to see how others live. 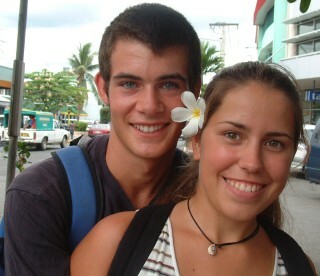 We (especially Amanda and Adam ) hope to meet up and cruise together again in Vanuatu next June. This past year has been a little different from our other cruising years. One year ago we were still back in the Northwest enjoying time with family and friends, and playing in the snow! After January, the year has been blocked pretty neatly into 4 months in French Polynesia (with lots of great visits from friends), 4 months in the Kingdom of Tonga (where we settled into the community more than anywhere else we've traveled), and now the end of the year in Fiji. We had a two-week, slow downwind to sail to Tonga in May (arriving just before our 25th wedding anniversary), and a short 3-day sail over to Fiji in October. 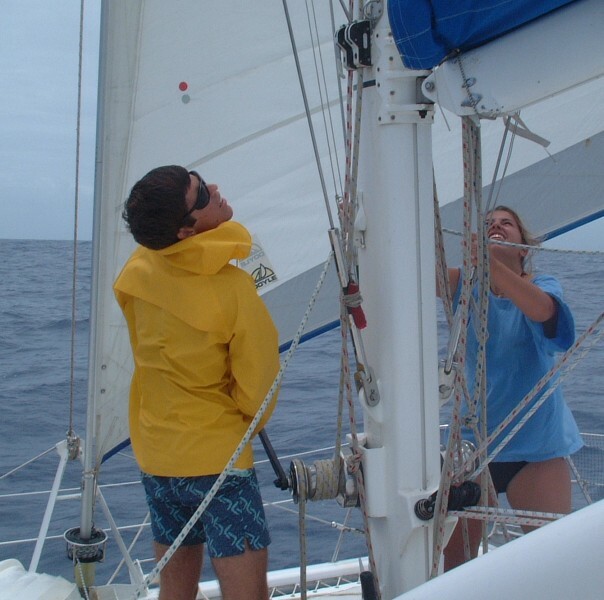 The kids have both continued their studies on board, and are now both deep into a university-level marine biology textbook along with the usual math, language, and cultural studies. Unlike last year when we often traveled together with other cruising boats with teens, this year we were off the beaten path, and off the time-line for other cruisers. We finally got an influx of cruising families in Tonga, and were almost convinced to sail south to New Zealand with them in November. However, Chris's need to take university exams and get his university applications done, plus our dislike of cold weather sailing has kept us in Fiji. 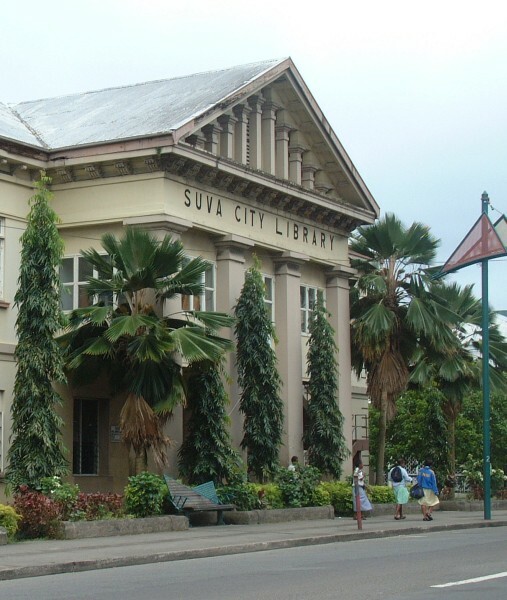 The city library is often closed due to lack of funds for staff, and donated books being held up in customs. We find the political situation in Fiji both interesting and complex (meaning we might have some details wrong...). Back when the British ran Fiji as a colony, they imported lots of Indians as indentured laborers. 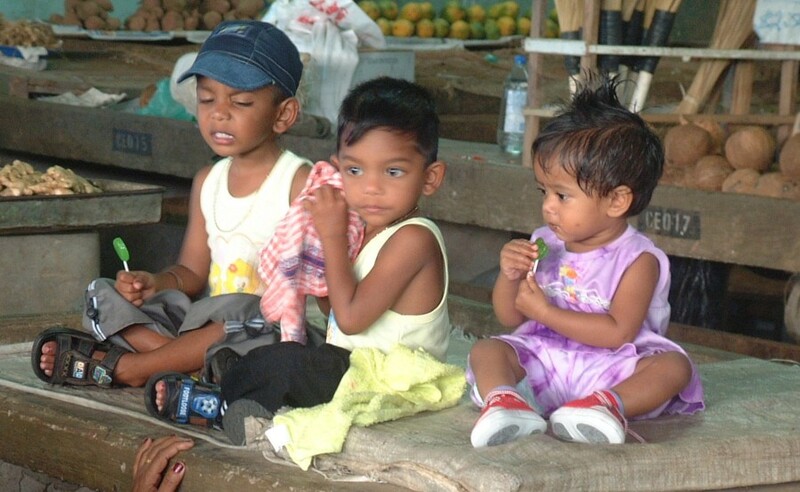 These Indo-Fijians have now been here for several generations and consider Fiji their home, but their work ethic is very different from the indigenous Fijians, and this creates some friction. As a general rule (and much of this is generalizations, not applicable to all individuals) Indians have a somewhat western work ethic, willing to work hard to better their lives and to provide a better life for their families and children. We've encountered Indians all over the world (except Tonga, where the royal family seems afraid to let them in) and they're often the businessmen (or at least the shop-keepers) of the world. 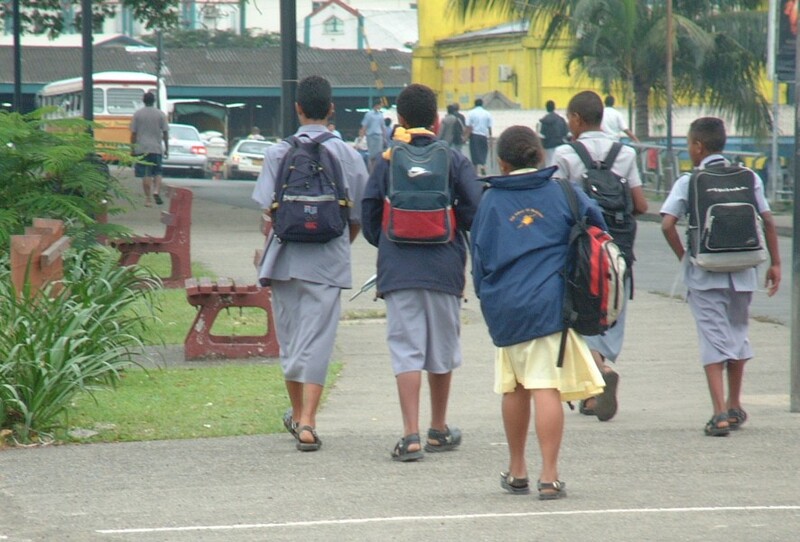 Native Fijians seem to have more of a Polynesian work ethic, preferring a much lower-stress lifestyle that keeps them fed today but doesn't go much further. 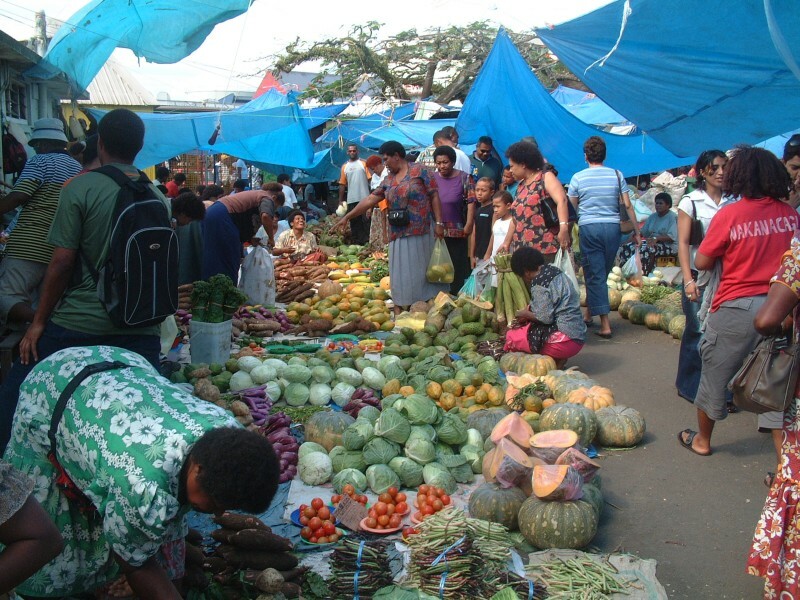 Yet Fiji is cosmopolitan enough to have cars, TVs, and other consumer goods, which the Indo-Fijians can buy but many of the Fijians can not. The Indo-Fijians are definitely the driving economic force here. Chris and Amanda shake out a reef on a blustery sail to Savusavu. Fijian's elect some of their representatives, and Indo-Fijians have the voting franchise, but much has to get approved by the (very Native) Council of Chiefs. There are a couple dozen Chiefs of the various areas/tribes that make up Fiji. While historically they've been warring enemies, and still often disagree, none of them want to see Fiji ruled by Indo-Fijians. Yet all voting seems to go along ethnic lines. So when the Indo-Fijians won many seats in the late 90s, the Chiefs caused coups to throw many of the elected officials out, even though the country was running much more efficiently under the Indo-Fijians. Fiji has so much going for it - ample land, mineral resources (even gold), great reefs for tourists, a reasonable communications and transportation infrastructure (it's a hub for several severely under-utilized undersea cables), and a reasonably educated and willing workforce. As an immigrant to the US, Jon feels that the multi-culturalism of the US is one of our greatest strengths. We hope the Fijians can overcome their ethnic difficulties and realize their potential. It's a wonderful country. As for the future, we're hoping to escape Suva and go back to Savusavu for Christmas and/or New Year, as we have many friends up there. Then we're off to dryer western Viti Levu to pick up Jon's father and niece, who'll be with us for several weeks, exploring the reefs around the Mamanuca and Yasawa island groups (we just LOVE the names here) at the western end of Fiji. In March, we're hoping to come back to the US for a couple of months so Chris can choose which university he wants to go to, and so he can take some of the Advanced Placement exams that might give him some university credit. The rest of us will probably return to Ocelot in May and head west for Vanuatu, New Caledonia, the Great Barrier Reef, and OZ. We'd like to wish all of you the very best Season's Greetings at this joyous time of year, along with peace and prosperity for the New Year.